Sorry, I was tidying up my desk so I could doodle a bit more and got side-tracked by a few things. This was one of them. I had dragged out an old stamp set that was completely unused. 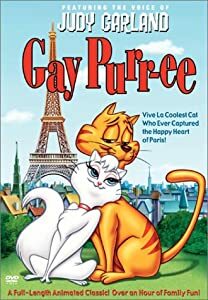 I am so not a cat person, but the cats reminded me of the slinky city cats from a book I had as a child, called Gay Purr-ee. I found that book in the garage at some point and must have bought the stamps soon after! I had been playing with the gear and experimenting with more than one stamp on my home-made paddle, as well as multi-layered stamping, so while tidying, and just about to toss out a bit of leftover packaging, I had an idea. So I did this quickly to demonstrate. For my first round, I used both the cat and the text together on the paddle. They were just a bit too tall for the kit paddle. After stamping the first round, I wanted to add another round of the cats without the text, but needed to place them just so. 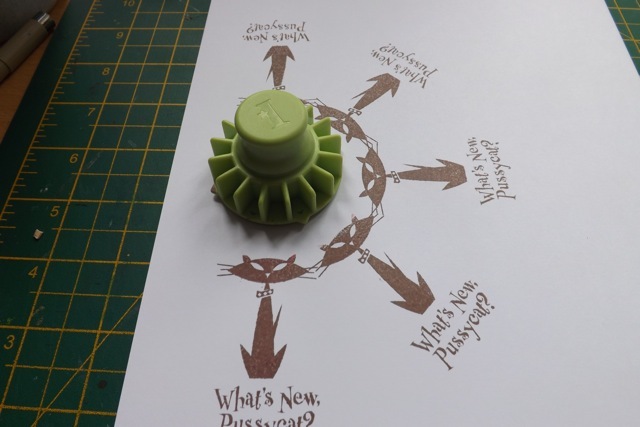 As the demos I’ve seen I could have cleaned and dried the stamp, then laid it on the sheet and pressed the paddle on to attach the stamp in the exact right place, but I was still worried if I used the same stamp any little smudge of ink left on it was going to mar the card. Enter the packaging. Stamp goes stamping area down on the packaging, perfectly placed, then the paddle into the gear over it to pick up the stamp. I did this a bit on the fly, and the depth of the packaging was not needed. 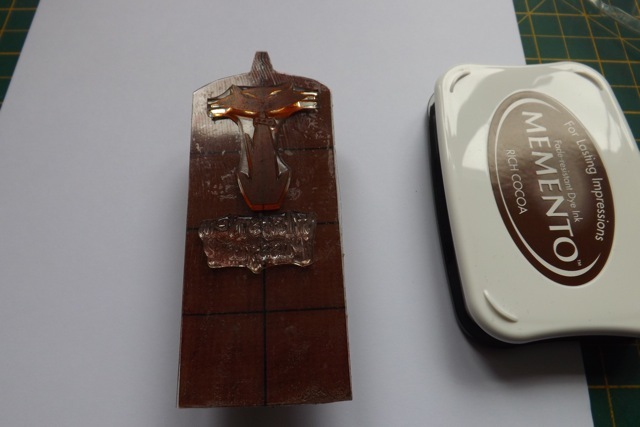 I would say a better plan is to cut off the raised edging so the acetate part lies flat and you can get the notch in the paddle easier so you know you are going to be stamping in exactly the right place. Actually the whiskers are slightly too far left on the black cats – I put that down to the fact I didn’t cut the packaging down so it was flat. 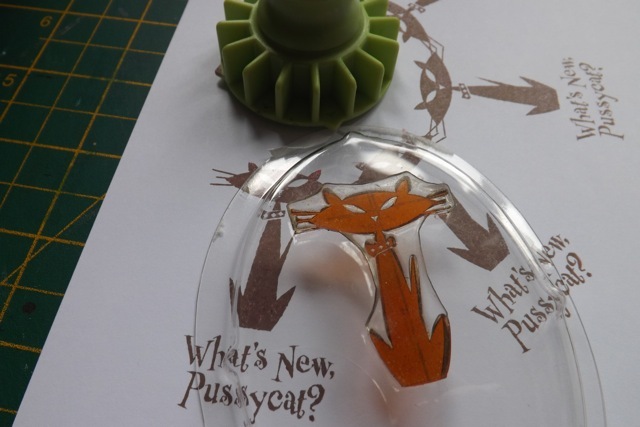 To be fair, you could use just a scrap of transparency film, or even the scraps that the stamps from the kit are attached to, but the harder packaging is less likely to be thrown out by mistake! I also quite like the yarn detail on the left. Fraying the multi-strands looks bow-like but yarn and cats, well, they go together, don’t they, better than a ribbon bow? Now my desk is pretty clear I have a few more doodle experiments to play with…. Categories: cards, stamping | Tags: cards, stamping gears, stamps | Permalink.